The Tablelands is a scenic one hour drive west from Cairnsand offers some excellent rainforest activities and a variety of accommodation options. Stay in the historic Yungaburra village or escape to one of the rainforest cabins surrounded by crater lakes and waterfalls. Welcome to the Atherton Tablelands! Situated one hour drive west from Cairns at an altitude of 400 â€“ 1100 metres, the Atherton Tablelands is a treasure trove of natural wonders and gourmet delights. Shaped by volcanic activities, the diversity of this rural landscape is quite impressive, featuring lush mountains, green valleys, sparkling lakes and streams, spectacular waterfalls, endless plains, grassy savannahs and pockets of ancient World Heritage listed rainforest.Here the temperatures and humidity are generally lower, farming thrives and wildlife abounds. Among the rolling hills dairy cattle graze on green pastures and farms grow tea, coffee, nuts, corn, vegetables and flowers for local and export markets. Charming small townships come alive with weekend country markets, these are a fascinating treat with locals sharing their arts, crafts, music and festivities. People who choose to live here are united by community, culture and heritage, their love of nature, and the abundant wildlife. Atherton is a prosperous and bustling town servicing a thriving agricultural region. It was the first town settled in the area, and is now the major town of the central and southern Tablelands. A visit to Hallorans Hill, the highest point in Atherton is a must. This lookout offers the most spectacular views over the region.Picnic and barbeque facilities are available here, as well as a childrenâ€™s playground and walking track.You can also see a number of pieces of artwork that have been created by some of the region's artists. The biggest town on the Atherton Tablelands is Mareeba, which has a reputation as a food and coffee lovers paradise. Over 90% of Australia's coffee crop is grown here and you can taste and buy at a number of local attractions. Two of the region's major events are the annual Mareeba Rodeo held in July and the Mareeba Multicultural Festival in August. 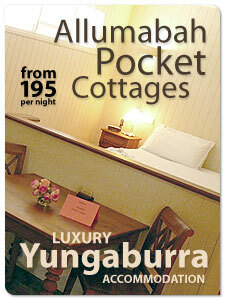 Yungaburra is a historical little country town which has remained largely unchanged since 1910. With 18 heritage-listed buildings, it is the largest National Trust village in Queensland. Take a stroll around the township to reveal charming cafes, historic shop fronts, arts and crafts galleries, award winning restaurants and country cottages. The renowned Yungaburra Markets takes place on the fourth Saturday of each month and is the largest of all country markets. Nearly all the products sold are locally made or grown. Kuranda is well known as the 'Village in the Rainforest' attracting visitors from around the world with its blend of indigenous culture, arts & crafts, alternate lifestyles, walking trails and wildlife attractions. Famous for the Kuranda Markets which have been a feature of the village for over 30 years, you can choose to travel to Kuranda via two of the region's icons: the Kuranda Scenic Railway or Skyrail Rainforest Cableway. At 920 metres elevation, Ravenshoe is Queensland's highest town and one that offers spectacular and diverse scenery with a mixture of dense rainforest, sub-tropical flora and rolling mountain pastures. However the most popular attraction by far is the ultra-modern wind turbines which generates enough electricity to supply approximately 3,500 homes. Situated on the extinct Windy Hill volcano, its 20 wind turbines take advantage of the consistent winds on the volcanoâ€™s slopes. Millaa Millaa Falls is one of the most photographed sites in the entire region, an image captured by thousands of visitors each year. The Millaa Millaa Loookout is another great photo opportunity capturing the best views on the Tablelands. Rolling hills and green pastures make this land a popular spot for dairy farming. Visit Mungalli Creek Biodynamic Dairy & Cafe for fresh dairy products, and tastings. Malanda is a quiet town located about 25kms south-east of Atherton. The township is the centre of the dairy industry featuring one of the world's largest dairy factories supported by over 190 local dairy farmers.Malanda Falls is a popular recreation area, the falls flow all year round and its brook meanders through rainforest providing a home to many turtles and platypus. Herberton township is a living museum, the cool, dry climate has preserved much of the past. To gain an appreciation of the towns history a visit to the Herberton Historic Village is a must. Here you will get to relive yesteryear as this outstanding collection of Australiana is showcased in an entire vintage village of over 50 buildings. Tolga's foremost attraction is the established fine woodwork gallery, Tolga Woodworks, on the main road.The gallery features exquisitely crafted handmade timber pieces ranging from small spinning tops and bowls to fine furniture. Nearby roadside produce stalls such as The Humpy and the Big Peanut are a great way to say g'day to a local and enjoy treats like roasted peanuts, local jams and freshly picked, seasonal fruits. A genuine outback town, easily accessed by conventional vehicles via the Wheelbarrow Way which starts at Mareeba. The famous Chillagoe Cave system is a visitor drawcard, once the site of an ancient coral reef has now eroded over time to spectacular underground caves, high ridges with dramatic, serrated towers and balancing rocks. There are around 560 known caves, the largest having over 11kms of passages. The Atherton Tablelands is a nature lovers paradise with a host of activities ranging from bush walking, bird watching and wildlife cruises to marsupial spotting, hot air ballooning and water sports as diverse as fishing to waterskiing. Lake Barrine and Lake Eacham are popular attractions, with the latter perfect for swimming, barbeques and picnics. Lake Tinaroo is frequented by the locals of the region, camping, fishing, water-skiing and sailing take place year round. At Granite Gorge visitors have a fantastic opportunity to get close and hand feed the wild rock wallabies in their natural habitat, meanwhile Platypus spotting is an active pastime at Peterson Creek in Yungaburra. The Mamu Rainforest Canopy Walk takes you on an elevated walkway through the canopy of World Heritage rainforest, providing spectacular views from the top of the tower, or for the ultimate scenic experience why not take a hot air balloon flight and enjoy the picturesque landscape at dawn. You can discover rare and beautiful wildlife of the Australian outback at The Mareeba Tropical Savanna and Wetland Reserve, sip coffee at Skybury, walk through the lava tubes at Undara, or get some go kart action on the international Maco Trac. The waterfall 17km circuit starts near Millaa Millaa off Palmerston Highway and includes Millaa Millaa, Zillie and Ellinjaa Falls. All of these waterfalls are spectacular in their own unique way, and most are surrounded by the peaceful serenity of the rainforest. Zillie Falls has a lovely viewing platform at the base of the falls where you can enjoy a view of the cascading water and rapids.Ellinjaa Falls cascades over a series of lava columns. Millaa Millaa Falls is one of the most photographed in Australia, the falls cascade perfectly to a pristine waterhole below where you can enjoy a refreshing swim in the cool water. Every weekend there is a market on the Atherton Tablelands.The largest and most popular is the Yungaburra Markets held every fourth Saturday of the month. Here you can purchase hand made products, fresh home grown produce, sample some culinary delights and catch a taste of the local culture. Other markets include Atherton 1st Saturday of the month, Mareeba 2nd & 5th Saturday of the month and Tolga 1st Sunday of the month. The Tablelands offers a tranquil escape, stay longer and explore more. 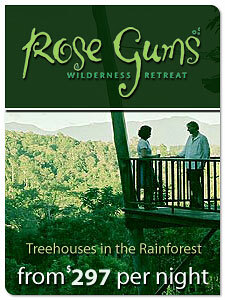 Accommodation comprises of luxurious tree house retreats, cute cottages and simple eco-lodges. Stay in the historic Yungaburra village or escape to one of the rainforest cabins surrounded by crater lakes and waterfalls. A perfect escape and opportunity to recharge and immerse yourself in nature. The Atherton Tablelands is the fertile food bowl of the tropics, so it's no wonder that dining options are plentiful with the freshest of produce available right on the doorstep. There are plenty of charming tea houses to visit where you can enjoy a devonshire tea and homemade meals along with a magnificent view; or experience some great old fashioned hospitality at a historical pub and enjoy a hearty, wholesome meal. You will find exquisite fine dining in Yungaburra, with Flynns Restaurant producing French & Italian cuisine, Eden House serving contemporary Australian cuisine and Nicks Swiss Italian Restaurant that not only serves great food, but great entertainment and theme nights also. There are also plenty of coffee stops along the way with a must being Skybury Coffee Plantation in Mareeba. Wildlife is abundant on the Tablelands as the Wet Tropics region is home to about a third of Australiaâ€™s 315 mammal species. Here you will get to experience a great range of native Australian tropical wildlife in their natural environment. The best time to go wildlife spotting is at night when you may catch a glipmse of shy tree kangaroos, Rare Possums, Flying Foxes (Bats), Bandicoots, Boydâ€™s Forest Dragons, snakes, Musky Rat Kangaroos, Betongs, Pademelons, Frogs, Lumholt'z Tree Kangaroos, and Sooty Owlsâ€¦ and in the wet season look out for luminous fungi and glow worms too. Tablelands Folk Festival, Yungaburra - brings with it a smorgasbord of both local and national acts drawn from the entire folk and acoustic music spectrum. Tastes of the Tablelands, Atherton - Visitors to the Tableland will be able to have the full food experience from the land to the table at this festival. Farmers from across the region will be selling their produce on the day allowing visitors to see fresh produce at its best. The Mareeba Multicultural Festival - The Mareeba Shire is home to people from some 64 different nationalities and cultural backgrounds, who have lived in harmony for many years before "Multiculturalism" became popular. The festival highlights this diversity and harmony. This is a chance for visitors to attend a major local community event. How you arrive at the Atherton Tablelands depends on the approach you take. There are five main gateways to the region. From the north, the route is via the Rex Range Road just north of Port Douglas travelling through the towns of Mt Molloy and Julatten.The eastern coastal access is via the Kuranda Range Road from Smithfield and the western gateway is via Mt Garnet and Ravenshoe. From the south, two main routes lead to the plateaux - the Gillies Highway winds its way up from Gordonvale, and the Palmerston Highway links the Great Green Way and Innisfail with the southern region. Self driving the Tablelands is highly recommended as this provides greater flexibility, with more options to be able to visit all the main attractions as well as some of the region's best kept secrets!.. The Waterfalls Circuit' is a circular trip of less than one hour, which encompasses Millaa Millaa Falls, Zillie Falls and the Ellinjaa Falls. The Waterfalls are a scenic 30 minute drive from Yungaburra. Bring your Camera!..